Patriot Act Expires, But So What? 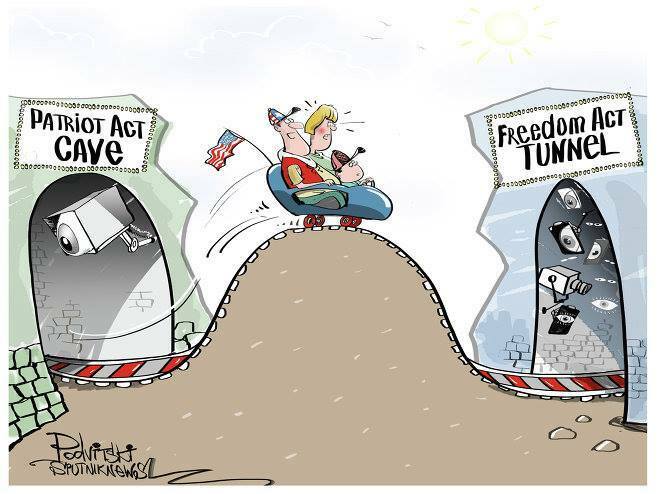 >> Home , Government , Patriot Act Expires, But So What? Parts of the US Patriot Act expired this past Sunday. That doesn’t carry the kind of permanence one might expect when they read the word “expire”. When food “expires” we throw it out and get newer, fresher replacements. When people “expire”, we have funerals and write eulogies. When bills expire, however, it’s just temporary until they can get around to resuscitating it back to life. While I have little respect for our loophole-rich congressional procedures, I would at least expect “expired” bills to get kicked to the back of the line and wait its turn to be re-enacted. I mean “kicked-to-the-back-of-the-line” in the DMV sense, where the line is worked with the same ruthless inefficiency as any other government agency. Section 215 of the Patriot Act (i.e. the mass collection of phone records belonging to innocent individuals not suspected of any terrorist activity). This is also the same provision that allowed the federal alphabet soup to access financial records and transactions such as wire transfers as well as internet business records. Important to note: existing “investigations” don’t stop even though the very provision has expired. So whatever they have on file now can remain active and enjoys a sort of grandfather clause. Rand Paul experienced a small victory in his efforts to delay the renewal vote in the Senate. He really did buck the establishment on that one. Naturally voices raised over the impending doom and peril waiting on the other side of an expired Patriot Act. The cynic in me really did expect the recent “Anthrax Scare” to be brought up, since the timing of it was just TOO coincidental to be a coincidence. Of course when your own government harbors LIVE anthrax, and then decides to ship it via FedEx, it’s not the foreign terrorists that are to blame is it? It’s the ones in our own government. I believe him. I am finding that politicians first go through the proper protocols to get what they want. They either create a bill or bury their measure within a bill. Either way, it’s up for a vote. When they don’t get their way, however, other means are sought. Example: politician puts a tax hike up for a vote; it gets shot down. In a completely unrelated event, that same politician introduces a new fine for violating some ordinance. Everyone violates that ordinance, so ultimately, the politician gets the “tax” he wanted. How many things have been passed by executive order? How many exceptions to the ACA have we seen where the President just overrides the existing law with his words? They will get what they want. Of that we can be sure. There is another measure in the Senate up for discussion called HR 2048 or “USA Freedom Act”. This is supposed to put some limits on the surveillance activity by the NSA. But asking the phone companies for the information hardly seems like a huge hurdle considering the telcom companies have long since offered their cooperation in these matters anyway. It’s a very lengthy act that attempts to reform some of the provisions in the Patriot Act and reintroduce them back into law. But here’s the real rub: As Rand Paul aptly points out, the US federal government has plenty of tools and provisions at its disposal to address the issue of “terrorism”. The Patriot Act, in addition to it being constitutionally and legally dubious at best, is superfluous! Of the three provisions that expired, the Lone Wolf has never once been used, the roving surveillance was used 11 times with NO reports indicating its success or usefulness in apprehending a terrorist, and Section 215 has all but proven to be a bust. Pen Registers: I had to google this one because for as much as I try to keep up with all the monitoring, I just can’t! Per Wikipedia, here’s what it is: “A pen register, or dialed number recorder (DNR), is an electronic device that records all numbers called from a particular telephone line. The term has come to include any device or program that performs similar functions to an original pen register, including programs monitoring Internet communications.” There is one statute for foreign related matters and another for domestic related matters. Both exist independent of the Patriot Act Section 215. Before there was the Patriot Act of 2001, there was FISA of 1978. This was providing for government acquisition of business records from transportation carriers and freight facilities long before W’s presidency was a glimmer in his father’s eye. There are also warrants that can be obtained under FISA, although the burden to get one is actually constitutional: probable cause. Electronic Communications Privacy Act (ECPA) D-Order: Like every other bill, it’s a total misnomer because this bill has ZERO to do with privacy other than violating it. It essentially gives the government the ability to obtain ISP related metadata with probable cause. JUST KIDDING! They actually only need: “specific and articulable facts showing that there are reasonable grounds to believe that . . . the records or other information sought, are relevant and material to an ongoing criminal investigation.” Reasonable grounds to believe??? Here’s a reminder of what “reasonable” means in gov-speak. Administrative Subpoenas: From what I can ascertain, the more appropriate name for these is “Because I’m From the Government and I Said So” Subpoena. Basically just about any federal agency can issue this subpoena for customer records, and the provider must comply. You would be wrong if you thought this would have to pass through a judge’s hands or require probable cause. It doesn’t. “There are roughly 335 federal statutes on the books passed by Congress giving dozens upon dozens of federal agencies the power of the administrative subpoena, according to interviews and government reports,” reports Wired. The DoJ used them to get over the obstacles of the Wire Tap Act by issuing what was called the “2511 Letters”. Under this umbrella also falls the “National Security Letter” or NSL which typically comes with a gag order attached to it. But much like the Administrative Subpoena, it’s just issued on official letterhead by the FBI, and full compliance is expected. And we might as well include John Doe Summonses while we’re at it. That’s when I issue a subpoena for someone… but I don’t know who yet… so I get to comb the entire US looking for them. So there you have it. The good news is that Section 215 of the Patriot Act expired! *High fives all around! * The bad news is it doesn’t matter because the US federal government has plenty of recourse.